This project is something that I had thought about for many years, but it was a trip to Ireland that set it into motion. I had made arrangements to deliver a harp to a customer there, and Roisin (the owner of the new harp, an Otway replica) set up a meeting for me with her teacher- Siobhan Armstrong. Coincidentally, Siobhan is chair of the Historical Harp Society of Ireland. When Simon Chadwick, another central person in this organization, heard that I would be meeting with Siobhan to discuss harps, he arranged to travel to Ireland also. We met on March 18th, 2005 at Siobhan's house, and discussed many things, including the need for an entry level harp that is specific to the study of Early Irish harp technique and the music it brings to life. After much consideration, we arrived at a list of features that we considered to be essential to these instruments, and identified those features of the extant museum harps which could be simplified in the interest of keeping the cost down. The Trinity College Harp, which resides in the Library of Trinity College, Dublin was selected as the model that we would pattern after. Upon my return to Minnesota, USA, I got out my notes taken when Ann and Charlie Heymann and I studied this harp in January of 2002. I laid out the string band on paper, checking and rechecking to be sure that the Student Trinity would have the same string lengths and spacing as the original harp. I compared my drawing of the harp itself to Robert Bruce Armstrong's monumental work of the early 20th century, and to my photos taken of the harp at the Library. Only then did I simplify the outline, and make up my construction plans. The Society was pleased, and placed the initial order. I wanted to retain the character of the original, including weight and balance and resonance. 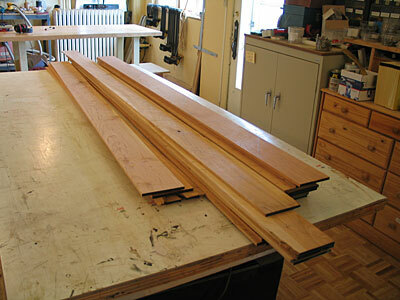 Since there is reason to believe that fruit or nut trees were sometimes used for the neck and/or pillar of the old harps, I chose American black cherry wood for these parts. 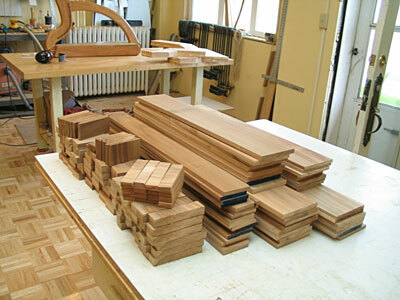 This wood is of medium weight, as hardwoods go, and looks attractive without any stain or complicated finishing techniques. 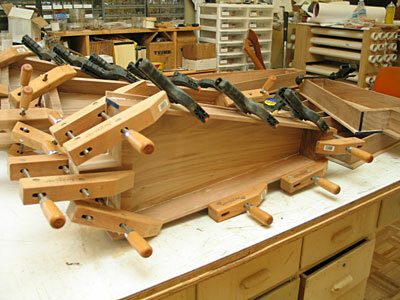 The laminated unit eliminates troublesome joints in this assembly, and ensures that each harp is exactly the same shape and size as the next. 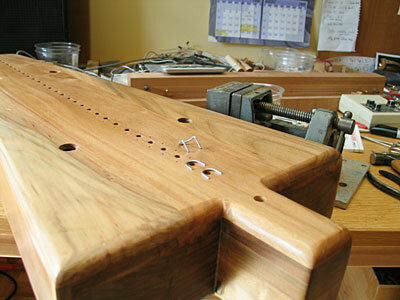 For the soundbox, which is invariably willow in the originals, I used black willow, a commonly available American hardwood. 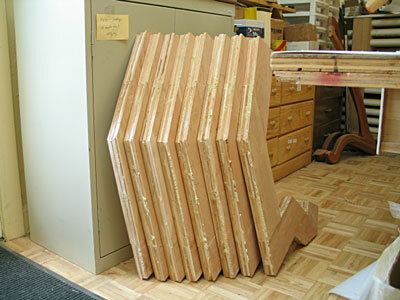 The boxes of the old harps were built by hollowing out a huge chunk of wood, but as you will see in the construction photos that follow, I glued up pieces of wood. 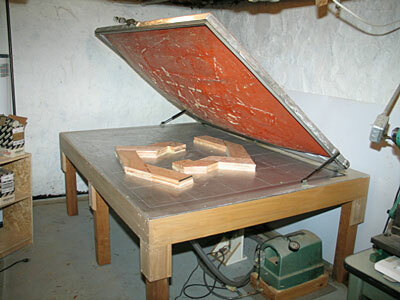 I took care to orient the pieces of wood as they would be in a hollowed out box. 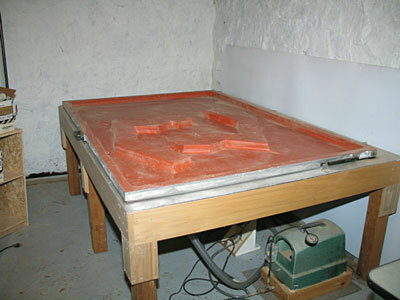 In my opinion, this type of soundbox has acoustic properties very similar to a hollowed-out box, at a huge savings in labor. 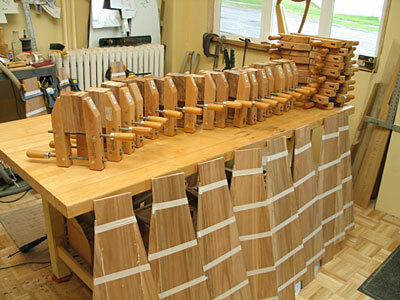 The first shipment of Student Trinity harps went to Ireland in June, in time to be strung and tuned for the annual summer school of the Society. They have been received with enthusiasm and have given the study of historical Irish harps a great boost. 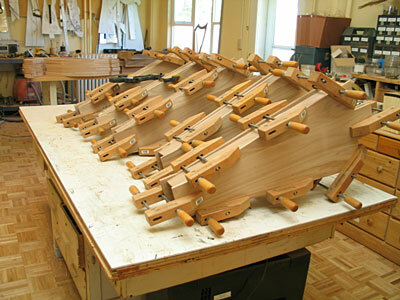 The Society has ordered more Student Trinity harps, to expand on this success, and has commissioned "Student" versions of some of the other old harps. We now produce a Student Queen Mary, Student Downhill, Student Lamont, Student Otway, and most recently a Student Mullagh Mast. 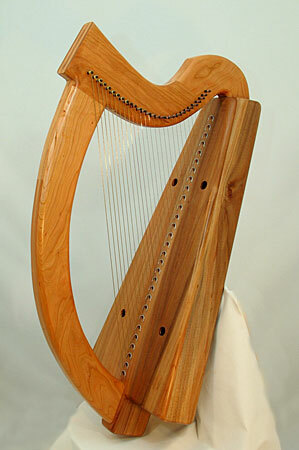 Student Model Early Irish harps can be purchased directly from the HHSI website. 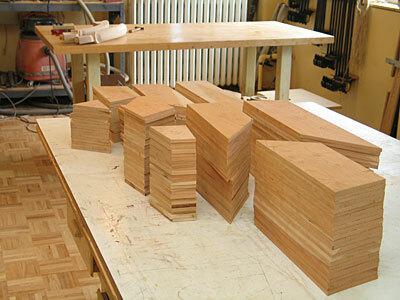 Cherry wood, ready to become harp necks. 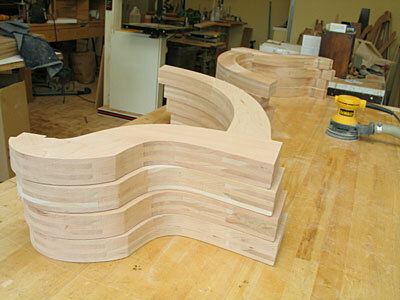 Neck parts ready to be laminated. 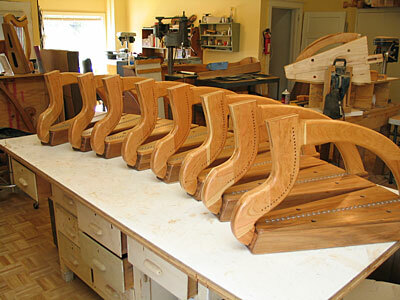 Neck parts glued, ready to be vacuum pressed. Template is traced onto lamination. 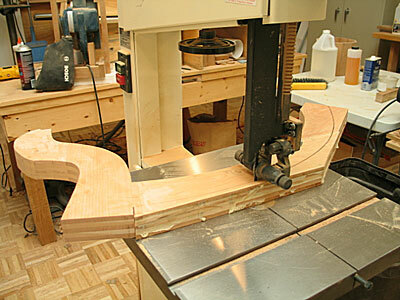 Neck/pillar units cut to shape. 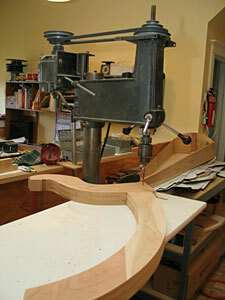 Drilling holes for the tuning pegs. Willow pieces ready for glue-up. 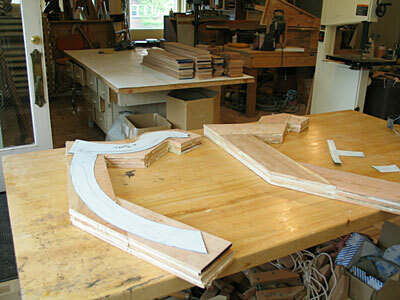 Soundboards glued together, end blocks glued also. 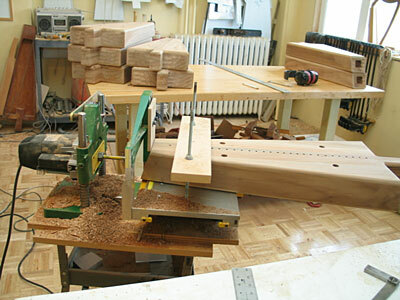 A mortise is cut in the top to receive the neck. "Shoes of the strings" are installed. Student Trinity harps ready to go to Ireland. Back to Wire Harp page.